Shame on me! For the first time in a decade, I forgot to celebrate Towel Day. The fact that my towel proved so incredibly useful a couple of days earlier makes me feel even guiltier. Douglas Adams is admired by most of his fans because he was not just tremendously funny, but also a shrewd freethinker who loved to show people how limited and simple-minded their views and beliefs are (anyone remember the Total Perspective Vortex?). But actually, he himself had his eyes opened one day by another person: in an interview with BBC, Douglas Adams disclosed that one of the most influential, eye-opening books he had read was “The Blind Watchmaker” by Richard Dawkins. In his book, Richard Dawkins demonstrates that by Darwin’s Theory of Evolution and natural selection enormous complexity can arise out of even the simplest building blocks and that there really is no need for a Creator. Douglas Adams and Richard Dawkins were so like-minded that it’s no wonder they later became close friends. This exactly describes what happend to me one day when a muslim taxi driver tried to “prove” to me that there indeed must be a god. “See”, he said, “the theory of evolution just can’t be right. If we humans are really decedents of animals like apes and dogs, why are there still apes and dogs around?”. I refrained from arguing with my taxi driver, even though it was obvious that he didn’t understand the Theory of Evolution at all. How could I resist the temptation? I absolutely admire Richard Dawkins for his wit and I recommend that you watch all of his Youtube talks and videos, but there is a problem with atheists like him: sometimes, they are just as annoying as followers of any other conviction when they try to foist their views on others. Even if we know that Creationist’s arguments are utterly wrong from a logical and scientific point of view, it doesn’t help: it’s a documented fact that a significant part of humankind has a strong desire for spirituality. And, as we all know, whenever strong desires are involved, appealing to logic doesn’t work: drug addicts do know that drugs ultimately kill them but they nevertheless don’t quit. Likewise, deep in their hearts, many believers in god assume that there is no god, at least not one like the one that is depicted in the holy scriptures, but they need a god for their mental well-being, anyway. Trying to prove to them that there is no Creator is a) futile and b) hurts them — not physically but emotionally. This is why I didn’t argue with the taxi driver. I strive to follow the Golden Rule, which — incidentally — also appears in many holy scriptures: always treat others the way you want to be treated. So why I and many other people prefer to have their eyes opened, others don’t. 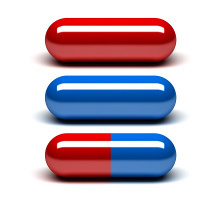 Everybody should be free to choose the color of the pill they take.